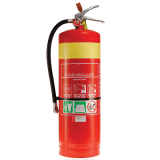 Wet Chemical Fire Extinguishers are distinguished by an oatmeal coloured band around the top, and are effective against fires involving cooking oils and fats. They are also suitable for Class A fires. Wet Chemical extinguishers are therefore a must in any commercial kitchen with deep fat fryers. 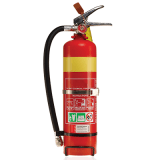 Our wet chemical fire extinguishers offer a true wet chemical unit with a fast acting solution.